Bought these batteries for my UPS following a quick check with the team at Tayna to make sure they were the correct ones. Excellent product slotted straight into the UPS once the connectors had been swapped over. The delivery was the usual rapid delivery from Tayna. No problem purchase, speedy delivery, fits exactly. They understand you need the replacement a.s.a.p. Excellent Comms, would recommend. Excellent Batteries at a great price. Has my APC - Smart - UPS 1500 running fine now after the original batteries finally failed after 5 years. Exact replacement. Fast delivery and very well packaged. Highly Recommended. 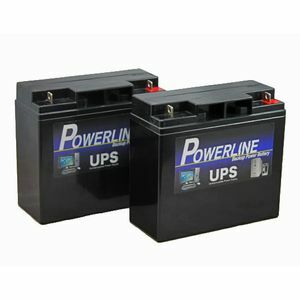 The batteries are packaged well, perform brilliantly and all for an excellent price. This is now my second purchase and I'll not be going anywhere else. Bought those for my APC UPS after checking with TAYNA that they would fit my model. Prompt delivery and batteries in and unit working again. Excellent service. Worked exactly as advertised. A perfect drop in for my APC ups. A good quality product delivered quickly. I assembled these batteries and fitted them into my APC SMT1500I UPS with no problems at all. The UPS diagnostics correctly identified the new batteries without any issues, so they would appear to be an exact equivalent to the APC originals. Excellent batteries. Arrived next day and perform better than the originals, highly recommended. As with previous purchases, looks like a quality battery. Installation in an APC Smart-UPS 1500 will be very easy; just YouTube "RBC7 Battery Replacement for APC SmartUPS 1500". Thanks Tayna: my client's UPS investment has just been extended a few more years.